Mercia – the very name means “kingdom on the border”. The border in question was that between the English and the Welsh. These lands were where a permanent barrier and border was established between what became Wales and the rest of England. They were also the lands that saw some of the most tragic events recorded in the Welsh anals and poems. This is because much of what is now Shropshire and Worcestershire were the last parts of England to be conquered from the Welsh. the modern county of Powys is off to the west in the mountain fastness of Wales. Yet in the 6th and 7th centuries the Kingdom of Powys stretched out far into modern England, indeed nudging far out beyond Shrewsbury accross the fertile plains of Shropshire. This was the “Paradise of Powys” refered to in the Welsh poetry and mourned when finally lost in the 7th century. What then was this Mercia – this kingdom on the border that deprived the Welsh of this paradise and pushed them west into their hills? Mercia was the last of the Anglo-Saxon Kingdoms to emerge and was not fully formed until the late 7th century. It was also the last kingdom to abandon faith in the old gods in favour of the new religion of Christianity – some parts of what now is the Black Country remaining pagan until the 8th century. The early years of this kingdom are lost in the darkest years of the dark ages – those misty decades of the 6th century where there is almost no documentation. What do we know of the people who came to these “Midlands of Britain”. Who were they? Traditions trace the people back to a certain King Offa or Uffi who was king of the Angles in Jutland – Modern Denmark. At some point his people joined the migration of the Anglo-Saxons westwards in to Britain. They probably first settled in East Anglia. 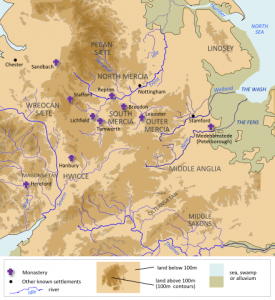 Then – so the stories go – Offa’s grandson Icel established a kingdom in the Trent valley around or near Lichfield and Tamwerth. He established a dynasty of kings called the Iclingas who would rule these lands – with certain interruptions for the next three centuries. We start to emerge from the mists around the year 585. This is the year when it is thought Icel’s great grandson Creoda became kings. Creoda may have had to fight to establish territory in the area around Tamworth and Lichield. This would almost certainly have been against the Welsh – or Roman British- still living in these regions but it may have to also have been against the Saxons of Wessex as the two tribes seem to have come into conflict in the south- eastern parts of what became Mercia – perhaps along the Thames valley or in Oxfordshire. Creoda died in the same year – 593 – as a powerful king of Wessex called Ceawlin – so was this at a now forgotten battle? Pybba suceeded Creoda and was probably his son. We know little of Pybba’s reign other than he seems to have pushed the Mercia authority south and west into the Cotswolds. It appears during his reign some accommodation was found with the Welsh kingdoms of Gwynedd and Powys were made for these nations would become allies of Mercia soon. Pybba died around 606. He left several sons and daughters and yet they may have been too young to inherit or to exercise sufficient authority for now another king who was not of the direct decent took over. Ceorl is a bit of a mystery. Its possible he was a cousin of Pybba and so still an Iclingas. On Pybba’s death he takes over, bypassing Pybba’s eldest son Penda. Ceorl is important because his daughter Cwenburgh married Prince Edwin of the southern Northumbian land of Deira. Edwin was a man in exile due to a rival King, Aethelfrith of the northern land of Bernia, having seized Deira and united Northmbria under himself. This marriage was a political gamble for it meant challenging the authority of Aethelfrith by giving support to Edwin. Was Mercia in an alliance with Powys and Gwynedd at the time in an attempt to oppose the power of Northmbria? We are not sure. What we do know is that Aethelfrith moved south and crushed Powys and Gwyedd at the battle of Chester. This could have destroyed the alliance and resulted in pressure on Mercia and that perhaps Edwin was there after no longer welcome at his father in law’s court because he was soon after on the road again – eventually finding support in East Anglia whereby he regains his throne. Ceorl survived the incident and reigns until about 626 AD. Penda 626-655. After Ceorl’s death Penda was able to inherit the throne. Penda re-established the alliance with Gywenned and with king Cadwallon of that nation challenged Edwin of Northmbria. At the battle of Hatfield Chase Edwin was killed and Mercia for a while ruled all of Northumbria, even ranging as far north as to lay siege to the mighty fortress of Bamburgh. During and following Penda’s reign the struggle between the dominance of Mercia and Northumbria was played out, power flowing back and forth between the Kingdoms. Penda died in battle himself in 655 and Mercia fell under the rule of Oswy of Northumbria. Penda’s son Peada (655 to 6) was weak and did not last long and was murdered by his own wife possibly as a political move instigated by Oswy. Wulfere 658-675 Wulfere was the first christian king of Mercia. In his time the Cathedral at Lichfield was founded. He was mighty in battle and having first led an uprising to wrest control of Mercia from Northumbria followed up by multiple campaigns in all directions. For most of his life no one seemed able to oppose him. He was able to expand his power by battle or politics so that at certain times all of Kent, Essex, Sussex and Surrey and even London was under his control. Via vassle states – the Hwicee, Magonstaen and Wreconstatae he pushed his power west pretty much to the modern Welsh border and – in an act the echoed on for centuries in the Welsh poems, he took over the ‘paradise of Powys’ or Shropshire. These kings and those legendary ones that preceded them carved out and Anglo-Saxon Kingdom in the Midlands that would rise to become a major power in the 7th through to the 9th century when the Vikings invasions saw an end to a powerful Kingdom.